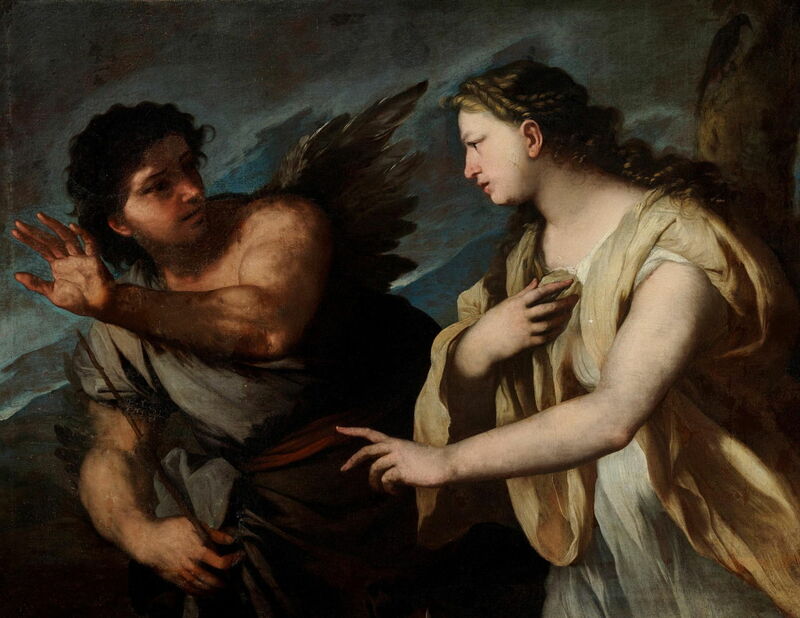 Luca Giordano (1634–1705), Picus and Circe (date not known), oil on canvas, 99.8 x 124 cm, location not known. Wikimedia Commons. Macareus, one of the survivors of the Odyssey, has been telling his account of the sojourn of Ulysses and his men on Circe’s island. Having told of their arrival and transformation into pigs, he completes his story with a cautionary tale of what happens to those who don’t submit to Circe’s desires. One of Circe’s assistants showed Macareus a marble statue of a youth with a woodpecker on his head. When Macareus asked why that was in the shrine, the assistant explained that it all came about as a result of Circe’s magic powers. Picus had been the king of Latium, and drew admiring glances from nymphs wherever he went. He fell in love with a beautiful young woman who sang so wonderfully that she was named Canens (Latin for singing), and they lived in wedded bliss. One day, Picus was out hunting on his horse when Circe caught sight of him from the undergrowth. Her desire for him was immediate and intense, so she worked her magic to lure Picus into a thicket, in pursuit of a phantom boar which she had conjured up. of Picus as he was except the name. of wild animals. None kept his proper shape. wandering at random over hill and dale. wearied and lying on his widespread bank. about to die sings a funereal dirge. fitly named Canens by old-time Camenae. With the King of Latium transformed into a woodpecker, his courtiers into sundry wild animals, and his wife vanished into thin air, Ulysses and his men finally left Circe’s island, and Macareus finished his stories. The story of Picus, Canens, and Circe with its multiple transformations would appear to be ideal for the visual artist. Ovid’s account is quite vivid, and the story appears in both Homer’s Odyssey and Virgil’s Aeneid. Oddly, it has remained little-known, and seldom-painted. The only dedicated account available is Luca Giordano’s Picus and Circe, probably painted around 1670. This shows Circe trying to seduce Picus, and the king resisting her advances. By their expressions, she has just told him that he will pay for his refusal, and is working her magic to transform him into a woodpecker. Already he has grown feathery wings, and at the upper right there is the silhouette of a woodpecker as an ominous reminder of the fate that awaits him at any moment. There are more paintings, though, which show Circe in the company of various enchanted birds and animals, including the former King Picus. Two of the more remarkable examples are both by Dosso Dossi, one painted in about 1515, the second probably fifteen years later. Dosso Dossi (–1542), Circe and her Lovers in a Landscape (c 1514-16), oil on canvas, 100 × 136 cm, National Gallery of Art, Washington, DC. Wikimedia Commons. Dossi’s Circe and her Lovers in a Landscape (c 1514-16) is a remarkably early and realistic mythological landscape, with deep rustic lanes, trees, and a distant farmhouse. Circe leans, naked, at the foot of a tree going through spells on a large tablet, with a book of magic open at her feet. Around her are some of the men who she took a fancy to and transformed into wild creatures. There’s a spoonbill, a small deer, a couple of dogs, a stag, and up in the trees an owl and what could well be a woodpecker, in the upper right corner. 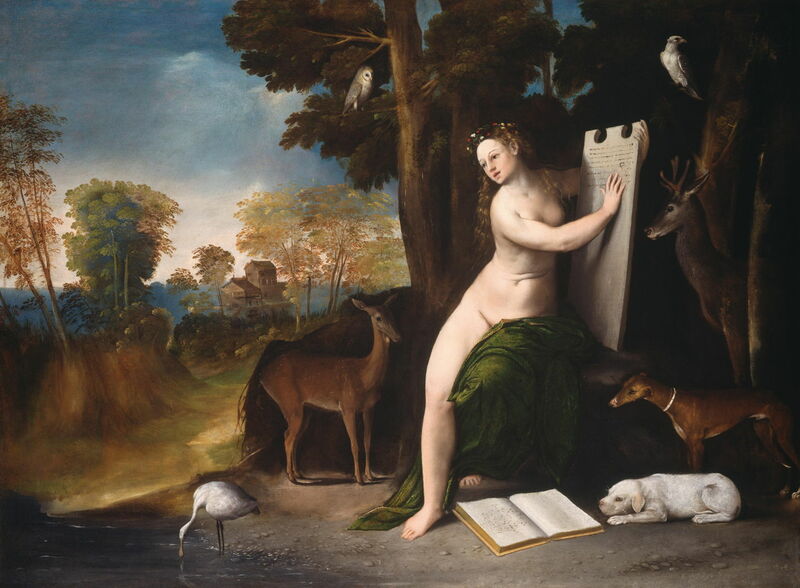 Dosso Dossi (–1542), Melissa (Circe) (c 1518-1531), oil on canvas, 176 × 174 cm, Galleria Borghese, Rome. Wikimedia Commons. 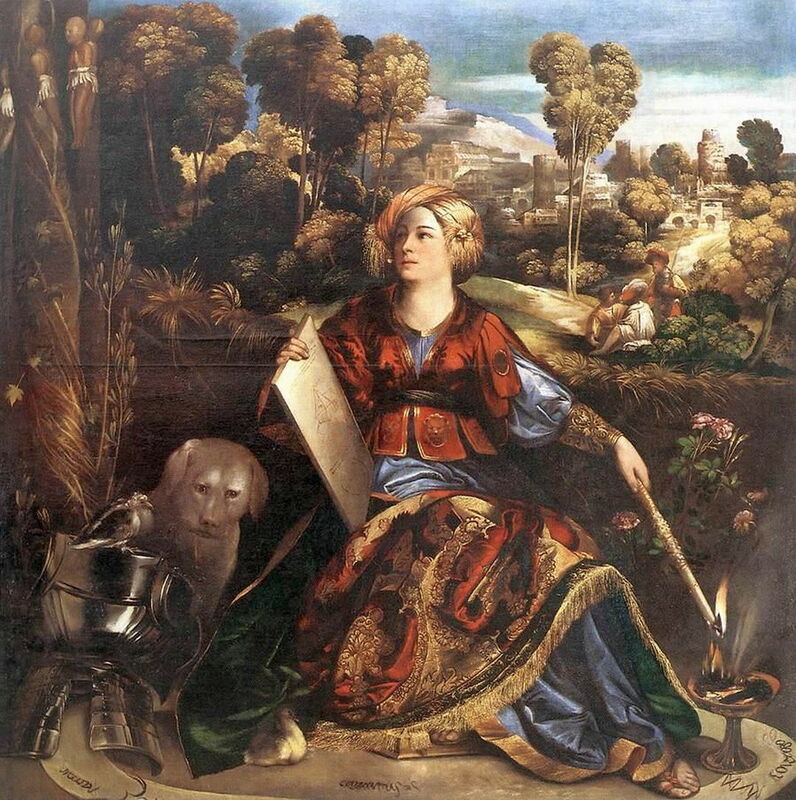 Dossi’s later painting of Melissa (Circe) (c 1518-1531) is also set in a richly detailed landscape. Circe sits inside a magic circle, around which are inscribed cabalistic words. In the upper left corner are small homunculi apparently growing on a tree. On the left is a large dog, and perched on top of a suit of armour is a bird, most probably a woodpecker. Disappointingly, although Circe inspired paintings by several of the Pre-Raphaelites, none came close to the story of Picus and Canens, or of her bad habit of collecting in animal form those men who refused her desires. Posted in General, Language, Life, Painting and tagged Dossi, Giordano, Metamorphoses, myth, narrative, Ovid, painting. Bookmark the permalink.